Many years ago my mother gave me the first five books in Jan Karon’s beloved Mitford Series. I’m embarrassed to admit that this cherished collection sat on my shelf, overlooked for more than a decade! I can’t even explain exactly what prompted me this past December to pick up the first in the series, At Home in Mitford but I am so glad I did. Since then I have finished the first four books in the series. A Light in the Window (#2) These High Green Hills (#3) Out to Canaan (#4) and I am currently in the 5th book, A New Song. Did I mention that there are a total of 14 books in the Mitford series! This excites me more than I can say! 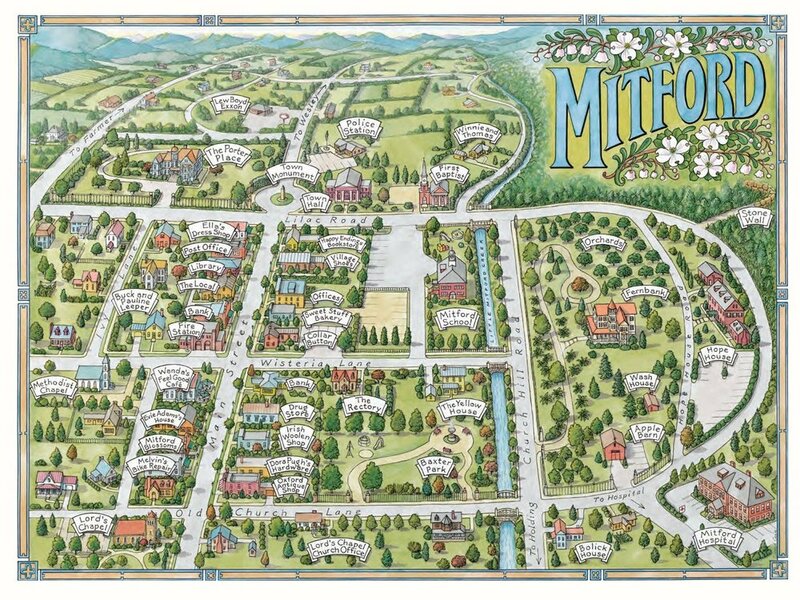 The Mitford series focuses on a charming town in NC and the Episcopal Priest, Father Tim of The Lord’s Chapel. Karon does an amazing job of making her characters come to life and she makes me want to live a slower paced life. These books make me more aware of my relationships with others, appreciating even the smallest of interactions, finding joy in the present moment and recognizing God’s grace more abundantly . I find pieces of myself in each of her endearing characters and I can honestly tell you that I have never read a book series that left me missing the characters when I had to put the book down. Honestly I feel like I am operating in two worlds right now, I go through my day living my very blessed and busy life and in the evenings, when my house is still and quiet, I slip off to Mitford and reconnect with old friends. The best part is, I feel like I bring a little bit of Mitford into my real life and it makes me enjoy life a little bit more. If you have not read the series, I encourage you to head to your library, bookstore or of course, Amazon and you can learn more about the author, Jan Karon, and her words at her website.